Ultrastar® hard drives feature up to 10 times the workload rating1 of desktop drives and employ advanced technologies for enterpriseclass reliability, power efficiency and performance. 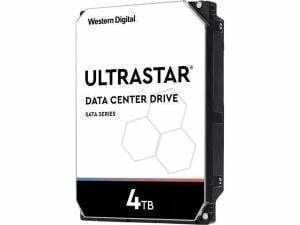 Designed from the ground up to be an ultra-robust storage device, Ultrastar drives are the perfect choice for your business. Delivering dependable performance to any storage environment, Ultrastar hard drives are designed with a workload rating up to 550TB per year1, among the highest of any 3.5-inch hard drive. Featured in over 20 million shipped Western Digital hard drives2, HelioSeal technology enables the highest capacities and less turbulence on large storage arrays. And now on its fifth generation design, HelioSeal technology is field-tested and proven to deliver high capacity, reliability, and power efficiency you can trust. With up to 2.5 million hours MTBF rating, Ultrastar hard drives deliver reliability and durability, are built for yearly operation (24x7x365) within the most demanding storage environments and are backed with a 5-year limited warranty. Enhanced Rotational Vibration Safeguard (RVS) technology uses sophisticated electronics to monitor the drive and correct linear and rotational vibrations in real time for improved performance versus traditional desktop drives in high vibration environments. Each read-write head’s fly height is adjusted in real time to ensure consistent performance for reduced errors and optimized reliability. This 7200 RPM-class hard drive delivers the fastest performance with the highest workload rating of any high-capacity drive from Western Digital. Ensure you have the most capable hard drive regardless of the application with Ultrastar hard drives. The Ultrastar family delivers a long-standing tradition of reliability leadership with MTBF ratings of at least 2M hours and a 5-year limited warranty. Ultrastar quality, capacity, power efficiency, and worldclass technical support and service help provide customers with a lower total cost of ownership. Western Digital is dedicated to providing a complete portfolio of hard drives to create environments for data to thrive.